This extra spacious 5.9 cu. ft. oven easily accommodates a big roast, multiple casserole dishes or several racks of cookies. The European True Convection oven system is great for baking and broiling because heat is distributed thoroughly and food cooks evenly, so you can enjoy tastier results each time. Enjoy the flexibility to cook with different-sized pans simultaneously. Whether you're boiling water, melting chocolate or simmering sauce, there's a burner for your needs. The Triple Fast Boil element helps you boil water quickly and saves you time when cooking. Plus, the smooth ceramic surface is super easy to clean. Choose Steam for a virtually odourless oven in 20 minutes, or choose self-cleaning for a deeper clean. 6.6 cu. ft. 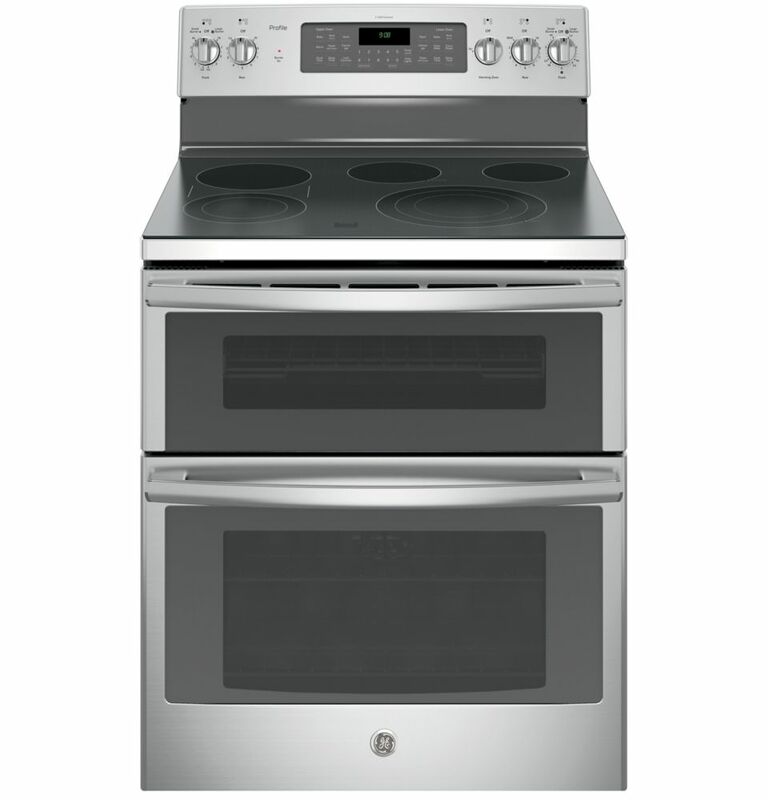 Free-Standing Double Oven Convection Electric Range in Stainless Steel GE Free-Standing ranges can be installed free from surrounding cabinetry, as the side panels have a finished appearance. This model features a smooth and seamless ceramic glass cooktop surface that makes cleaning quick and easy, along with electronic oven controls, one-touch electronic pads that are easy-to-use and allow for simple oven operation. GE's TrueTemp System manages oven temperatures to ensure accurate, consistent heating and total cooking performance. 6.6 cu. ft. Free-Standing Double Oven Convection Electric Range in Stainless Steel is rated 3.0 out of 5 by 1. Rated 3 out of 5 by jiangyn from Don't buy GE Ranger I bought this ranger in July. On Sept 26, the biggest burner was failed to work. I called the customer service to arrange the repair. Four weeks pass by, I was told the parts was out of order. There were five back orders before mine. That told this ranger had a really back quality! Terrible product quality! I called the GE customer service again and again, they promised a manager would call me back. Nothing happen! Terrible customer service! If you can avoid any GE product! Don't make the mistake I made!